In Memorium: Lorraine Breitman, esq. Members of the Collaborative Divorce Association of North Jersey mourn the loss of a valued colleague, Lorraine Breitman, who passed away November 1, 2014. Although she had only practiced collaborative law for the past several years, her colleagues knew she would be a wonderful ‘fit’ for the collaborative process. Lorraine was a family attorney for more than 25 years and was dedicated to helping make the divorce experience more respectful for couples and their children. She was a devoted wife and loving mother who cherished her 10-year-old twins. Lorraine was an energetic presence who filled a room with sunshine with her grace, humor and positive attitude. If she saw a problem, she not only addressed it but offered possible solutions. Our colleagues consider themselves fortunate to have known and worked with her. She will be sorely missed and long remembered. New Jersey has a reputation for being progressive in the development of statutory and case law with respect of family, divorce and custody matters. On September 19, 2014, New Jersey became the ninth state to enact a Collaborative Family Law Act.(NJCFLA). Passage of the NJCFLA reinforces general awareness that there are improved methods to resolve disputes rather than escalating acrimony via litigation, which can be financially and emotionally detrimental. The NJCFLA sets standards and unifies the concept of Collaborative Law already practiced in our state. Litigators who are interested in clients’ best interests recommend and attempt to utilize alternate dispute resolution techniques, when applicable to clients’ situations. New Jersey had already joined the national and international movement of Collaborative Law, which has been practiced in our state for years. The Collaborative Law method exists in 42 states and D.C. as well as 24 countries. Courts and attorneys have employed various alternate dispute resolution techniques for years, beginning with the concept of negotiating and settling issues with an agreement reached between the parties, with the help and guidance of their attorneys. To assist in such an undertaking, the Early Settlement Panel [consisting of experienced volunteer attorneys) was developed and implemented in all counties. Eventually, counties offered complementary custody mediation. Then, mandatory economic mediation was introduced and these procedures were implemented within the framework of the litigation process. Most parties in litigation realize, at some point, that alternate dispute resolution [ADR] is superior to proceeding to a costly and emotionally draining trial. ADR techniques have evolved in many cultures and in the court systems; the collaborative divorce method operates completely outside of the litigation system until the final resolutions of issues results in an uncontested divorce. Mediation can be pursued prior to or independent of litigation. However, not all couples are able to participate in mediation without ongoing assistance. It’s best for each party to have an attorney for legal advice. In Collaborative divorce, each party has an attorney, trained in mediation, trained in mediation as well who supports each client in positive manner that benefits both parties and their children. 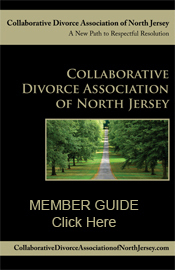 For those considering divorce, it is important to know that members of the Collaborative Divorce Association of North Jersey have been training for years in the collaborative method and are committed to its principles toward moderating the destructive aspects of divorce and creating a more constructive experience for divorcing couples and their families. Our collaborative divorce professionals have access to experts, as needed, who tailor the process to a couple’s, or family’s, specific situation and needs such as custody determinations, tax issues, evaluation tasks and legal issues. On July 9, 2014, the Collaborative Divorce Association of North Jersey was honored to have one of its members and past board member, Hubert Klein, CPA/ABV/CFF, CVA, CFE, give his presentation, “Guiding Clients: Financial Aspects of Divorce.” His presentation included collaborative divorce, mediation and litigation. Hubert offered a detailed review of the process of filing the complain, the response and management aspects of the divorce process. During a marriage couples accumulate a lot of financial personal date. An informative handout provided a detailed list of what each spouse should obtain to get a total picture of the marital estate. A second handout “Seven Financial Mistakes” was offered. Collaborative members appreciated this excellent educational opportunity . A Future International President in Our Midst ! The Collaborative Divorce Association is extremely proud to announce that one of its own, our immediate past President and current Treasurer and Board member, Shireen B. Meistrich, LCSW, has bee selected President Elect of the International Academy of Collaborative Professionals (IACP). Shireen currently serves as Secretary of the IACP and will assume the Presidency in 2015/2016. When Shireen assumes the Presidency of the IACP, she will be the first full-time non-attorney President of the organization. Shireen’s selfless contributions and commitment to the Collaborative movement, internationally and particularly in New Jersey with the Collaborative Divorce Association of North Jersey and as a founding Board member of the New Jersey Council of Collaborative Practice Groups, are unsurpassed. Shireen serves as a divorce coach and child specialist and is deeply committed to helping families resolve their conflicts with dignity and respect and to maintain a healthy connection after the divorce. LARRY J. ESPOSITO, ESQ.